Suicide bombers struck at three churches during mass on Sunday in Surabaya, Indonesia’s second biggest city, killing at least 10 and wounding dozens of others. The bombings were the deadliest in years to strike the world’s biggest Muslim-majority country. The Southeast Asian nation, which will begin the holy fasting month Ramadan this week, has been on high alert over attacks by homegrown militants, including some incidents claimed by the Islamic State group. No one has yet claimed responsibility for the Sunday bombings. “Nine people are dead and 40 are in hospital,” East Java Police spokesman Frans Barung Mangera told reporters, adding that two police officers were among the injured. The attacks took place at the Santa Maria Church in the Ngagel Madya area of Indonesia’s second-largest and busiest city, the Surabaya Centre Pentacostal Church and the GKI Diponegoro Church, the Straits Times reported. Television footage broadcast by major networks appeared to show a motorcycle driver entering the grounds of a church before a bomb was detonated. Other images displayed a vehicle engulfed in flames at one location. 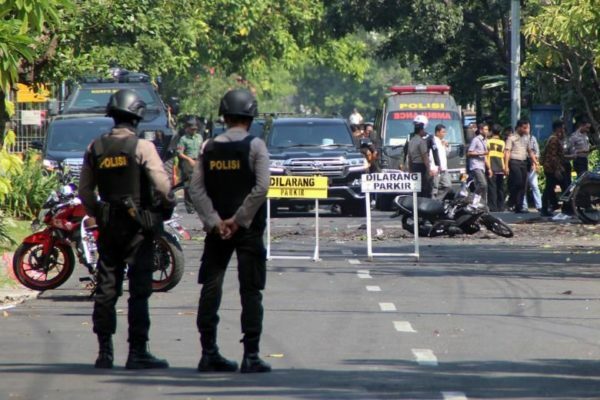 Police bomb experts were called in to disarm still active explosives at the Gereja Pantekosta Pusat Surabaya (Surabaya Centre Pentacostal Church), with an AFP reporter at the scene hearing two loud explosions. Images from one scene showed a body lying outside the gate of Santa Maria catholic church and members of Indonesia’s bomb squad poring over the rubble. At least one of the attackers was killed when they detonated their bomb at Santa Maria. It was not clear if any other perpetrators were among those killed or injured. “I was frightened… many people were screaming,” 23-year-old witness Roman told AFP after the blast at Santa Maria church. Police guarded a Sunday mass at another church in the city of Bandung, between the capital Jakarta and Surabaya where the bombings happened. The attacks come several days after five Indonesian police officers and a prisoner were killed in clashes that saw Islamist inmates take a guard hostage at a high-security jail on the outskirts of Jakarta. The Islamic State (IS) group claimed responsibility for that incident although police rejected its involvement. Indonesia’s 260 million people includes significant numbers of minority Christians, Hindus and Buddhists but there are concerns over rising sectarian intolerance and militancy.